The University of Canterbury in Christchurch is New Zealand's second oldest university. It was founded in 1873 as Canterbury College, the first constituent college of the University of New Zealand. The University of Canterbury in Christchurch is New Zealand's second oldest university. It was founded in 1873 as Canterbury College, the first constituent college of the University of New Zealand. Its original campus was in the central city, but in 1961 when it became an independent university it also began moving out of its original neo-gothic buildings, which were re-purposed as the Christchurch Arts Centre. The university now operates its main campus in the suburb of Ilam and offers degrees in Arts, Commerce, Education (physical education), Engineering, Fine Arts, Forestry, Health Sciences, Law, Music, Social Work, Speech and Language Pathology, Science, Sports Coaching and Teaching. 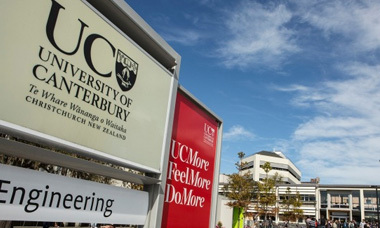 In 2015 QS World University Rankings ranked the University of Canterbury 211th overall in the world. Besides, UC was the first in New Zealand to have been granted five stars by QS Stars.